The Phillies advanced to the World Series after defeating the Milwaukee Brewers and the Los Angeles Dodgers in the National League's Divisional and Championship Series, respectively. The team won its position in the playoffs after its second consecutive National League East title. 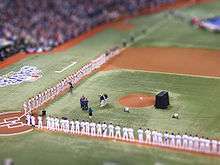 This was the Phillies' first World Series appearance in fifteen years. 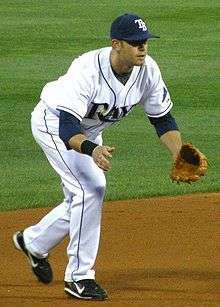 The Tampa Bay Rays advanced to the World Series after defeating the Chicago White Sox and the Boston Red Sox in the American League's Division and Championship Series, respectively. The team earned its first trip to the postseason in franchise history after winning the American League East title, only one season after finishing in last place. This was the first Series since 2001 without a wild-card team. 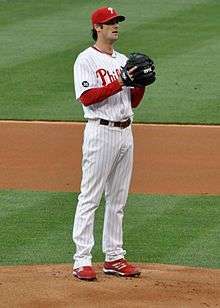 Philadelphia took a 1–0 lead in the bottom of the first inning, as Jimmy Rollins led off with a double and scored when Pat Burrell later walked with the bases loaded. The Phillies doubled their lead in the third inning when Chase Utley reached base on a fielding error and scored on Pedro Feliz's single. The Rays scored their first run when Carl Crawford hit a solo home run in the top of the fourth inning. 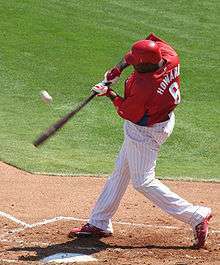 Ryan Howard's three-run home run in the bottom of the inning brought the score to 5–1. Tampa Bay's Eric Hinske hit a pinch-hit home run to bring the Rays within three runs, but Phillies pitcher Joe Blanton responded with a home run of his own to re-extend the lead to four; it was the first time a pitcher hit a home run in the World Series since Ken Holtzman in game 4 of the 1974 World Series. Blanton pitched six innings, giving up two runs on four hits to acquire his first win of the Series. Jayson Werth hit a two-run home run in the eighth inning—the Phillies third of the game—to bring the score to 8–2. Later in the inning Ryan Howard's second home run, and fifth RBI, increased the Phillies lead to eight runs. Philadelphia's four relief pitchers combined for three shutout innings, giving up one hit. Due to the late completion of the previous game, Games 3 and 4 each ended on the same calendar day. 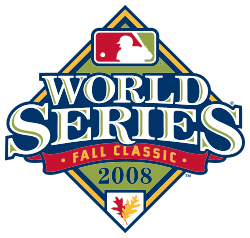 The game was suspended after the top of the sixth inning due to rain, making it the first game in World Series history not to be played through to completion or declared a tie. Phillies starter Cole Hamels, making his fifth start, had pitched six innings when the umpires suspended play and received a no-decision as the game was tied 2-2 in the top of the 6th. Games 3 and 5 of the World Series were delayed by rain storms in Philadelphia, with the start of Game 3 on Saturday, October 25 being delayed an hour and 31 minutes (with that game ending at 1:47 am EDT Sunday, October 26). Game 5, begun on Monday, October 27, was suspended after 6½ innings and resumed Wednesday, October 29. Wet weather which affected Game 5 continued into Tuesday in the Philadelphia area, as Major League Baseball officials studied radar data to determine when Game 5 of the World Series would continue under conditions deemed "appropriate." Up to this point, there had never been a rain-shortened game in Series history, and this was the first suspension. As a result, had it been necessary to play them, Games 6 and 7 in St. Petersburg, originally scheduled for October 29 and 30, were postponed until a later date. Subsequent regular season meetings between the Rays and the Phillies would be relatively uncommon. The Rays only visited Philadelphia twice within the next five years (in 2012 and as scheduled in 2015). ↑ Gilbert, Steve (October 21, 2008). "Umpires for World Series announced". MLB.com. Retrieved October 21, 2008. ↑ "2008 World Series". Baseball-Reference. Retrieved January 6, 2014. ↑ "Young caps marathon goodbye to Yankee Stadium with sac fly in 15th". ESPN.com. Associated Press. July 15, 2008. Archived from the original on September 14, 2008. Retrieved September 17, 2008. 1 2 3 4 5 Mandel, Ken (October 30, 2008). "Octoberphest! Phillies win World Series". MLB.com. Archived from the original on February 1, 2009. Retrieved December 22, 2008. 1 2 3 4 Sheridan, Phil (October 30, 2008). "WORLD CHAMPS!—28 years later, Phillies again are baseball's best". Philadelphia Inquirer. p. A1. Retrieved February 28, 2011. 1 2 "Playoff and World Series Statistics". Baseball-Reference.com. Retrieved June 17, 2009. 1 2 Joyce, C. Alan (2008). The World Almanac and Book of Facts (2009 ed. ; paperback ed.). New York. pp. 914–917. ISBN 978-1-60057-105-3. 1 2 "PHI 2008 Batting Gamelogs". BaseballReference.com. Retrieved October 25, 2008. ↑ Ortiz, Jorge L. (October 25, 2008). "Phillies assert themselves to take Game 1". USA Today. Retrieved October 25, 2008. ↑ Cherry, Gene; Osmond, Ed (September 28, 2008). "Phillies claim NL East but wildcard spot up for grabs". Reuters. Retrieved October 16, 2008. ↑ "Burrell's blasts help send Phils past Brewers, into NLCS". ESPN.com. Associated Press. October 5, 2008. Archived from the original on October 13, 2008. Retrieved October 16, 2008. 1 2 Corner, Jahmal (October 16, 2008). "Phillies beat Dodgers to reach World Series". Reuters. Retrieved October 16, 2008. 1 2 Mandel, Ken (October 16, 2008). "Phils reach first World Series since '93". MLB.com. Archived from the original on October 18, 2008. Retrieved October 16, 2008. 1 2 "Tampa Bay 2008 Game logs". BaseballReference.com. Archived from the original on September 17, 2008. Retrieved October 25, 2008. ↑ "Kazmir Leads Rays Over Rangers 7-3". TampaBayOnline.com. Associated Press. May 26, 2008. Archived from the original on June 1, 2009. Retrieved November 10, 2008. ↑ "Upton's two homers set tone as Rays wrap up spot in ALCS". ESPN.com. Associated Press. October 6, 2008. Archived from the original on October 10, 2008. Retrieved October 17, 2008. ↑ Browne, Ian (October 19, 2008). "Sox's playoff run ends with loss to Rays". MLB.com. Retrieved October 19, 2008. ↑ "World Series Game one". Box Score. MLB.com. October 22, 2008. Archived from the original on October 26, 2008. Retrieved October 22, 2008. ↑ "World Series Game two". Box Score. MLB.com. October 23, 2008. Archived from the original on October 27, 2008. Retrieved October 23, 2008. ↑ Newman, Mark (October 25, 2008). "Rain doesn't dampen enthusiasm". MLB.com. Archived from the original on October 27, 2008. Retrieved October 25, 2008. ↑ Footer, Alyson (October 26, 2008). "Howard ends homerless drought". MLB.com. Archived from the original on October 27, 2008. Retrieved October 26, 2008. ↑ "World Series Game three". Box Score. MLB.com. October 25, 2008. Archived from the original on October 29, 2008. Retrieved October 25, 2008. ↑ Leach, Matthew (October 26, 2008). "Blanton picks right time for first homer". MLB.com. Retrieved October 26, 2008. ↑ "World Series Game four". Box Score. MLB.com. October 26, 2008. Archived from the original on October 27, 2008. Retrieved October 26, 2008. ↑ "World Series Game five". Box Score. MLB.com. October 27, 2008. Archived from the original on October 31, 2008. Retrieved October 27, 2008. 1 2 3 Hoch, Bryan (October 28, 2008). "In a first, World Series game suspended". MLB.com. Archived from the original on October 28, 2008. Retrieved October 28, 2008. 1 2 Wojciechowski, Gene (October 27, 2008). "Selig made correct call in suspending Game 5". ESPN.com. Archived from the original on October 31, 2008. Retrieved October 30, 2008. ↑ Fine, Larry; John O'Brien (October 28, 2008). "Suspension leaves World Series in the balance". Reuters. Retrieved October 28, 2008. ↑ Hoch, Bryan (October 28, 2008). "Game 5 will not resume on Tuesday". Archived from the original on October 29, 2008. Retrieved October 28, 2008. ↑ "FAQs on the suspended Game 5". Archived from the original on October 29, 2008. Retrieved October 28, 2008. ↑ "Sports books pay as if Phillies won". Archived from the original on October 29, 2008. Retrieved October 28, 2008. ↑ "Ownership approves two major rules amendments". MLB.com. January 15, 2009. Archived from the original on January 21, 2009. Retrieved February 2, 2009. ↑ "Phillies are cream of the Trop". MLB.com. October 22, 2008. Archived from the original on October 26, 2008. Retrieved October 23, 2008. ↑ "Trop-ical paradise: Rays take Game 2". MLB.com. October 23, 2008. Archived from the original on October 25, 2008. Retrieved October 23, 2008. ↑ "Phillies 5, Rays 4". MLB.com. October 26, 2008. Archived from the original on October 29, 2008. Retrieved October 26, 2008. ↑ "Tampa Bay vs. Philadelphia". MLB.com. October 26, 2008. Archived from the original on October 30, 2008. Retrieved October 26, 2008. ↑ "Tampa Bay vs. Philadelphia". MLB.com. October 29, 2008. Archived from the original on October 30, 2008. Retrieved October 29, 2008. ↑ Geisler Young, LLC -. "World Series Gate Receipts and Player Shares". Baseball Almanac. Archived from the original on June 17, 2009. Retrieved June 14, 2009. 1 2 3 4 Hoch, Bryan (October 28, 2008). "Game 5 will not resume on Tuesday". MLB.com. Archived from the original on October 29, 2008. Retrieved October 28, 2008. 1 2 3 'Duk (October 27, 2008). "'Elmer Fudd' caps become hip during cold and wet World Series". Yahoo! Sports. Retrieved October 28, 2008. ↑ "Tentative 2008 MLB Postseason Schedule". World Series. MLB.com. Archived from the original on September 14, 2008. Retrieved September 16, 2008. 1 2 Sandomir, Richard (October 30, 2008). "In 78 Minutes, Not Much to See or Say". New York Times. p. B17. Retrieved October 14, 2010. ↑ Robinson, Joshua (October 28, 2008). "Umpires in Spotlight For the Wrong Reasons". New York Times. Archived from the original on April 17, 2009. Retrieved November 1, 2008. 1 2 "Umpires admit second missed World Series call in as many games". ESPN. Associated Press. October 27, 2008. Retrieved November 1, 2008. ↑ "Phillies receive trophy". MLB.com. October 29, 2008. Retrieved February 19, 2011. ↑ Newman, Mark (October 30, 2008). "Thrilla in Phila: Game 5 unforgettable". MLB.com. phillies.com. Retrieved February 21, 2011. ↑ Nunnally, Derrick (November 1, 2008). "A party for, oh, 2 million of their closest friends". Philadelphia Inquirer. p. F2. Some in the news media guessed two million, about the same number long tied to Flyers parades in '74 and '75, and more than the current population of Philly. ↑ Lin, Jennifer; Steele, Allison; Dwight Ott (October 31, 2008). "Parade for the Champs; Noon High: Million-plus expected at celebration". Philadelphia Inquirer. p. A1. In the annals of Philadelphia sports parades, the biggest crowd turned out for the 1974 celebration of the Flyers' Stanley Cup. More than two million fans flocked to Broad Street. 1 2 3 Rubinkam, Michael (October 31, 2008). "Fans roar as Phillies parade through city". FOXNews.com. Associated Press. Retrieved January 25, 2011. 1 2 3 Stamm, Dan (November 1, 2008). "Watch: Phillies Speak From the Parade of Champions". NBCPhiladelphia.com. Retrieved February 7, 2011. ↑ Antonen, Mel (July 16, 2007). "Phillies are No. 1 in loss column". USA Today. Retrieved January 25, 2011. Current Phillies starter Jamie Moyer grew up in [Philadelphia]...In 1986, as a member of the Cubs, Moyer beat the Phillies and his boyhood hero, Steve Carlton...for his first big-league win. ↑ Kram, Mark (May 6, 2010). 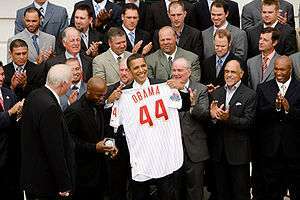 "Fans pick 2008 World Series as top Philadelphia sports moment". Philadelphia Daily News. Retrieved March 4, 2011. 1 2 3 Ghiroli, Brittany (October 31, 2008). "Rays' fans celebrate at rally". TampabayRays.MLB.com. Retrieved March 4, 2011.